This program has become synonymous with Mahalaya which is celebrated to usher the Debipaksha lunar fortnight and the Durga Puja. 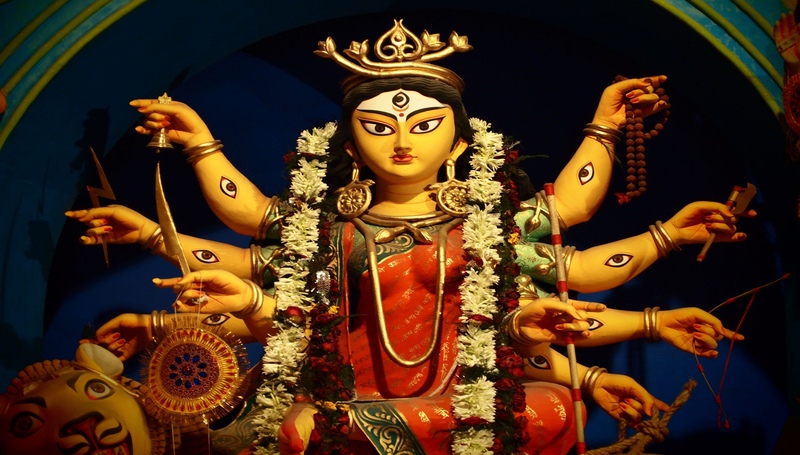 To this day, most of Bengal wakes up in the chilly pre dawn hours, 4 am to be precise, on the Mahalaya day to tune into the “Mahisasura Mardini” broadcast. Presently the recordings are available as audio cassettes and Compact Disks from HMV-RPG which has obtained the rights from All India Radio. The CD version (as of 2002) contains 19 tracks. Birendra Krishna Bhadra, who will always be remembered for making Mahalaya memorable to one and all, is the magical voice behind the “Mahisasura Mardini.” The legendary narrator recites the holy verses and tells the story of the descent of Durga to earth. It was on the day of Mahalaya, the beginning of "devipaksha", that the Gods and Goddesses woke up to prepare themselves for Durga Puja. In 1931, Mahalaya was first broadcast over the radio in Akashvani, Calcutta. The programme was organised by Premankur Aatorthi, Birendra Krishna Bhadra, Nripendra Krishna Mukhopadhya and Raichand Boral. So popular was his version of the recitation that when in 1974, the voice of noted Bengali actor, Uttam Kumar was employed for the programme, it did not get favorable response from the audience and it was shifted back to the original version of Biren Bhadra. Chandipath narrates that Durga is the primeval source of power, all qualities reside in her. She is one and yet known by many names. She is Narayani, Brahmani, Maheshwari, Shivaduti and the fierceful Chamunda, decked with a garland of skulls. The Goddess Chandika is eternal. She has no birth, no definite physical form. She assumes a manifestation of majestic might only to restore the process of Creation from the terrible Asuras or evil incarnates. It is initially said that when Lord Vishnu was in 'Yognidra', Lord p xBrahma, the creator of the universe, appears from Vishnu's navel (nabhi), while two demons named Madhu and Kaitav originate from Vishnu's ears. When these two demons attempt to kill Brahma, the latter then prays to Goddess Mahamaya with great devotion and ultimately Vishnu wakes up from his yognidra. Then, he slays Madhu and Kaitav with his chakra. The waking up of Lord Vishnu was possible only because the Supreme Goddess (who was in the form of Yognidra Devi) left him. Mahisasura, the terrible king of the Asuras had defeated the gods and driven them out of Heaven. The gods, dejected and humiliated went to Brahma, the god of creation. He, in turn, took them to Vishnu, the God of preservation and Mahadeva, the God of destruction, to report their defeat. The gods then projected their energy from their bodies and evoked a new form of energy. This energy then crystallised into the heavenly form of a Goddess. She was Mahamaya, the Mother of the Universe. The emergence of the Goddess was an auspicious moment. The Goddess then emerged in full battle array to combat Mahisasura. 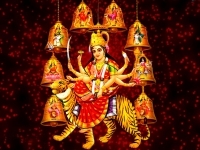 The Himalayas gave Her the lion to act as her mount, Vishnu gave her the Chakra, Mahadeva gave her the trident, Yama gave her the Kaal Danda, Kalbhairav (or Veerbhadra) gave the Khadga, Chandra gave the ashtachandra shield, Surya gave bow and arrows, Vishwakarma a protective armour called as kawach, Brahma gave her the rosary and the Kamandalu (container of sacred water), and Kuber gave her ornaments and necklaces. Armed with weapons of all kinds, the Mother Goddess defeated the Asuras, thus ending the rule of evil forces. The occasion of Mahalaya, thus, always goes on reminding mankind of the divine scheme of things that the Evil may have had its say, but it is ultimately the Good that has the last laugh. The story element speaks of the increasing cruelty of the demon king Mahisasura against the gods. Unable to tolerate his tyranny the gods plead with Vishnu to annihilate the demon. The Trinity of Brahma, Vishnu and Maheswara (Shiva) come together to create a powerful female form with ten arms - Goddess Durga or 'Mahamaya', the Mother of the Universe who embodies the primeval source of all power.